i love this little space here. this wee spec of internet real estate where everything is neat and tidy. where i can control beautiful object and colours and textures. where lovely people from all over the world pop in and visit me, leaving kind words and greetings, encouragement and ideas, and lead me to their own inspiring spaces. if you could see the state of our house these days and the number of weeks of mess still ahead of us on top of the months behind us, i think you'd fully appreciate how important it is to have this place where i can try and make things pretty. over the past few months i've been collecting prints and original pieces of art to make the house pretty as well, when that time comes, so that i can be surrounded by all the gorgeousness i see and am inspired by each day. my favourite piece so far. 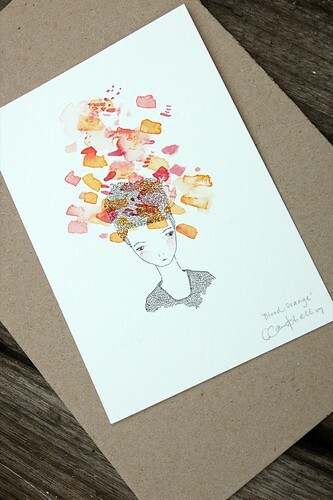 "blood orange", a small original ink and watercolour and part of the ice cream moments series by melbourne artist catherine campbell, who's etsy shop is my folk lover. it's truly amazing in person and prompted me to return to her shop to snap up "stawberry" from the same series (just waiting for her to get back from holidays to send it off to me). i'm literally aching to get these framed and hanging on a freshly painted wall, only weeks away now. oooOoooH that's a very beautiful print, how lucky!! I'm a big fan of catherine campbell too. hello to sweet little baxter too! Sending you lots of happy warm fuzzies and hope it all gets finished in time! We'll be doing a big renovation next year and I'm dreading it. Love the painting! Thanks for the link. Can't wait to see your room all done with the art your have collected. Oh wow, even though we're on opposite sides of the planet our worlds seem scarily similar at this precise moment in time. your blog is adorable, tidy and sweet. I love visiting your blog everyday. ..always something precious to read. Gives me smiles!! -- so sorry I never formally thanked you for the incredible gifts by the way. I'll have to post about them.. you spoiled me! Her work is very beautiful. I've been eyeing some of it up myself for a while now. Beautiful print! I cant wait for her to get back and list another print of the Strawberry! Thanks for sharing, I love finding new art! you are so lucky to find an original you love so much! they get snapped up so quickly. i love this print. good selecting!